Turning a classic lasagna into a vegan entree seems like a simple concept: just omit the cheese. Right? Well this recipe actually takes it a step further and replaces the typical ricotta filling with a tofu version...and it's actually good! And this is coming from a vegetarian who still eats cheese! Now I know you're probably thinking, vegan ricotta? Made with tofu? Well, yes. Open your minds! This stuff might actually be better than ricotta cheese, and it's surprisingly easy to make with just a few staple ingredients. Simply take your trusty food processor (my 7-cup version just barely fit everything), and add tofu, basil, Italian parsley, pine nuts, lemon juice, garlic, salt, red pepper flakes, and sugar. The ingredient measurements are perfect as is: the stuff comes out amazing and perfectly seasoned. It's eerily similar to both taste and texture of real ricotta; I think the pine nuts give it that coarse, sort of grainy texture that you'd be expecting. And interestingly enough, you barely taste the tofu; it's covered quite well with all the other additions, and the basil provides a really nice sweet herbal flavor. Next, saute sliced zucchini in olive oil. The recipe suggests using four "medium" zucchini (whatever that means), or about three cups sliced. Well, three cups sliced for me was three zucchini...but maybe I should have used the fourth, because the amount seemed a bit sparse when actually building the lasagna. On another note, I think spinach would be AMAZING as a substitute. And now it's time to build! It's pretty easy once you have the previous two components out of the way, since you're using no-bake noodles and jarred marinara sauce for everything else. 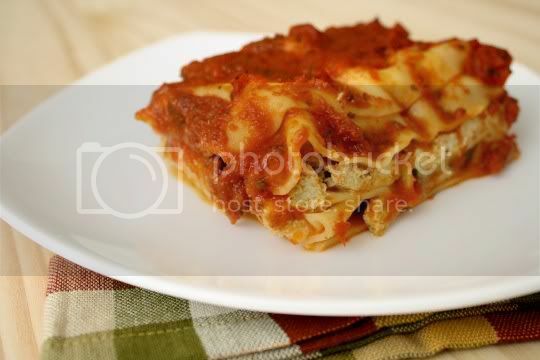 (WORD OF CAUTION: DO NOT use the no-bake lasagna noodles from Trader Joe's. I found out too late that they contain egg. Be careful!) I did use Trader Joe's Basil-Marinara Sauce ($1.99 a jar, how can you beat that?) which I think is surprisingly delicious (and vegan): full of flavor, tangy, sweet, salty. I needed about one-and-a-half 32 oz. jars for the recipe's called-for five cups, so make sure you buy accordingly. 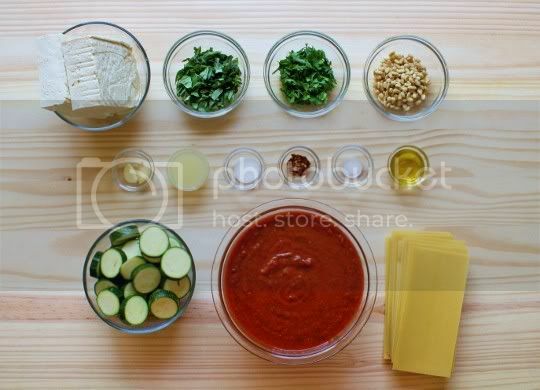 Once assembled (and your layers are spread with tofu ricotta and dotted with zucchini slices), your lasagna will look like it's absolutely drowning in sauce, but it ends up being fine in the finished product. Just remember, those no-bake noodles need to soak up liquid from somewhere to cook properly. Bake foil-covered for an hour, and get ready for vegan Italian goodness. The lasagna is filling and hearty, as is most traditional versions; truth be told, you probably could fool meat-eaters into thinking it's not vegan. The ricotta is totally foolproof, especially when the entire thing is drenched in a delicious marinara. The noodles are perfectly cooked, the flavors are rich and mouthwatering, and the zucchini is juicy with a bit of crunch. What's even more impressive, the leftovers fare extremely well...even frozen! Nothing weird or icky happens to the tofu, and it taste as good as it did the first day. Make again? Definitely...but I want to try spinach next time! Maybe even a little Daiya mozzarella on top! Absolutely fantastic. 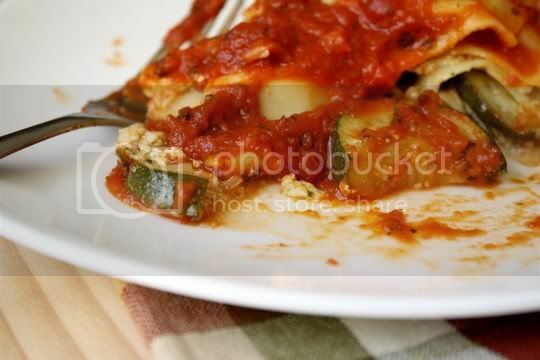 I have been searching for an easy vegan zucchini lasagne recipe for several weeks now. Thank you!